While Spring Break often conjures images of sun screen and lounge chairs, for these Texas students, spring break involved bug spray and visions of a landfill. 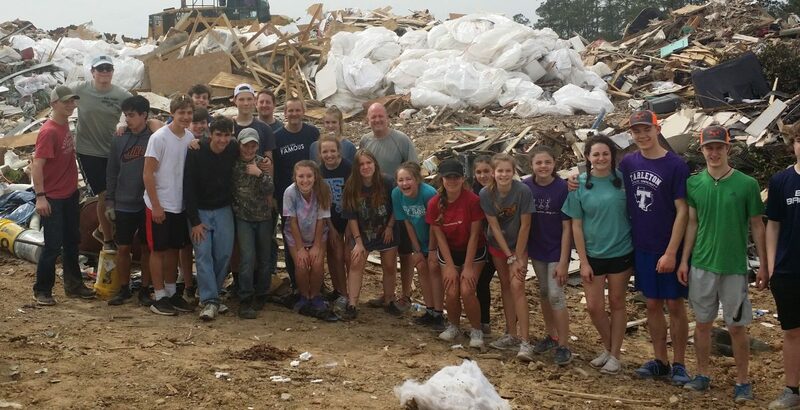 Last Monday, the student ministry of Lifepoint Fellowship (McKinney,TX) spent the day with us, cleaning up the construction debris from the previous week. They also removed the winter plastic from around our screened in camp dining facility and several other things. We rejoiced in the providence of God in the timing of their trip. We were able to let the construction team focus all their time on their project the week before, and not spend time in clean up, because we knew the students could handle that. I was encouraged by their willingness to do whatever needed to be done as well as their ability to work with each other so well. You could tell this wasn’t their first mission trip. The rest of the week, the Texas team worked with Back Bay Church, a new church plant here on the gulf coast. Pray for Pastor Adam Bennett, and the great work they are doing in D’Iberville, Mississippi, for the glory of God.